The Mi A1’s clutter-free, Android One-certified experience combines elegantly with tried and tested hardware, while the dual-camera capability gives you a premium feel on a budget. Xiaomi ticks all the right boxes with this affordable but feature-rich smartphone. When we talk about budget or mid-range Android smartphones, increasingly a Chinese phenomenon by the name of Xiaomi enters the conversation. Over the last few years, this company has torn up the rule book on what we'd normally expect from a smartphone that costs a third the price of an iPhone. Xiaomi's phones have traditionally offered much of what makes the iPhone experience so appealing - excellent design, simplicity of use and a self-contained ecosystem - in a budget package. Despite this, some Android purists have always yearned for more, citing Xiaomi's MIUI Android skin as the weak link; while it looks the part and offers impressive customization options, it comes with bloatware and bespoke optimizations which go against the grain of other Android-based handsets. Those disgruntled individuals can now put their fears to rest, as the Mi A1 is a union between those strangest of bedfellows: Xiaomi and Google. We say this because Xiaomi's software story has always been underpinned by putting Google's Android in the shade, and putting MIUI at the center of the galaxy of its products; MIUI has its own account system, app store and much more besides. With the Mi A1, Xiaomi created what could become the savior of Google's beleaguered Android One program, which originally strived to offer great hardware and software to entry-level consumers in developing nations. This program failed – ironically – because of Xiaomi's triumphant entry into the Indian market, which made a mockery of the under-powered devices which spearheaded the Android One initiative. But Xiaomi has now rebranded the Mi 5X as the A1 and placed Google's "pure" Android experience at the center of its interface. What we have here is a potential hydrogen bomb for the budget smartphone market, because on paper this phone delivers stupendous hardware, a refined design aesthetic and a secure software experience in a package that won't break the bank. Editor's note: While Xiaomi has a big presence in Asia and India, it has a far more limited reach in Western markets. That means you may struggle to find a store or local website stocking the firm's handsets, so you'll have to import devices into your country. With no official presence, customer support, repairs and servicing may be difficult to reach. While the Xiaomi Mi A1 is heading up Google's renewed Android One drive, it's not officially available in the UK, US or Australia as yet. You'll have to order it from a reseller online, with prices hovering around the £200/$250/AU$300 mark. The Solution Shop is offering the "international" version of the phone, which comes with software that supports a wide range of languages. It's also mercifully free from the kind of unnecessary bloatware that often comes installed on phones imported from China. Note however that it doesn't support all of the network bands used in some countries, including the US, so check this before you buy, as depending on where you are and what network you’re on it might not be a good purchase. The Mi A1 looks like a love child between the OnePlus 5 and the Xiaomi Redmi Note 4. The face of the phone will remind you of the Redmi Note 4, albeit with more rounded corners. On the back, it looks a lot like the OnePlus 5. It has an identical camera position and the antenna lines are also similarly designed. Essentially this is a repackaged Xiaomi Mi 5X – itself quite a new phone – and these aforementioned similarities aren't a bad thing at all. Criticize it for being derivative, but it is nevertheless a very well-built phone, especially when you consider its price. The construction is robust and everything feels suitably premium. Looks aside, this is a very functional device in terms of ergonomics. It's rather svelte at 7.3mm, and is rather light too, tipping the scales at 165g. The weight is also distributed nicely and it feels great, even if you're using it one-handed. One of the nicest things about the design is the way the chassis tapers and curves ever so gently from the sides towards the back. This creates a seamless line that runs along the spine of the handset, offering a smooth grip and great in-hand feel. These little things count. On the back, there’s also a super-fast fingerprint scanner which is placed – like it is on so many other Android phones – right where your finger naturally rests. Unlike the Redmi Note 4, it has a USB Type-C connector on the bottom, flanked by a very loud single speaker and a 3.5mm jack. On the top there's an IR blaster which allows you to control your TV or audio equipment. Below the Mi A1's 5.5-inch screen you'll find a trio of capacitive Android keys for the usual Menu, Home and Back commands. When these aren't in use they fade to black. Sadly, there's no NFC included with the device, perhaps because in several of the emerging markets Xiaomi and Google intend to push this device, mobile payments haven't really taken off yet. It's a shame as Android Pay is becoming more and more popular, especially in the west. The Mi A1 packs a 5.5-inch LCD display, which is a pretty standard size in the mid-range Android sector these days. Sadly, it comes with massive bezels at the top and bottom, a fact which not only makes the device bigger than it perhaps should be (the Xiaomi Mi Mix 2 is roughly the same size but boasts a 5.99-inch screen) but also means it looks a little dated when compared to 2017's leading devices. 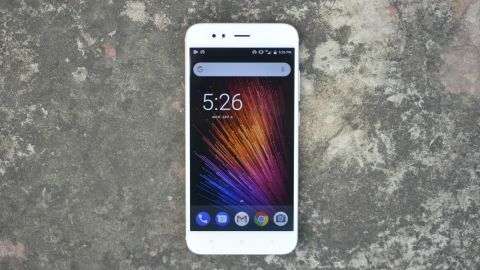 While it's perhaps unwise to expect budget phones to have jumped on the bezel-free bandwagon, Xiaomi has just announced the Redmi 5 which will combine a low price with a massive screen, while other Chinese companies such as Elephone and Maze are already producing devices with minimal bezels. The screen itself is bright, but colors look muted and contrast isn't awe-inspiring. Everything looks a little washed out, even when compared to other handsets in the budget sector. It's hard to complain too much when you're paying so little, but the screen definitely could have been better.